Hippeastrum, or Amaryllis, is a genus that is native to South America, located in the southern hemisphere. Did you know that the seasons in the southern hemisphere are the opposite of the northern hemisphere? During our summer months, the southern hemisphere is experiencing winter, and in our winter, it is summer there! This means that the Amaryllis–native to the southern hemisphere–blooms during the summer there, but during the winter here. The Amaryllis is one of the only naturally winter-blooming plants, which gives reason for it’s popularity around the holidays. Other holiday gift plants, like Hydrangeas and Hyacinths are forced to bloom during the winter months, and therefore require a little more attention than the real thing! The Amaryllis is a tropical plant that produces large blooms ranging in color from white to red to deep purple. The bulbs are generally large and fleshy, and are some of the easiest and most carefree bulbs out there. The bulbs produce tall, slender leaves that are evergreen, and perfect for year-round color. 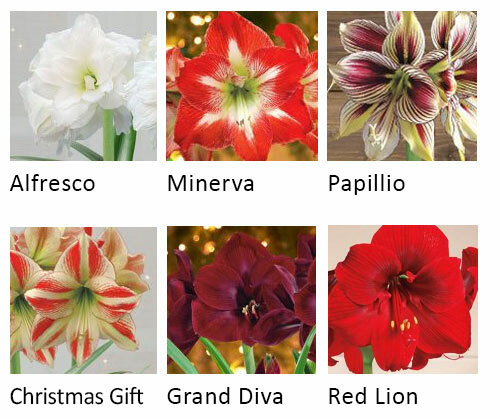 The Hippeastrum genus is usually grown indoors, and is one of the most popular winter-blooming bulbs. 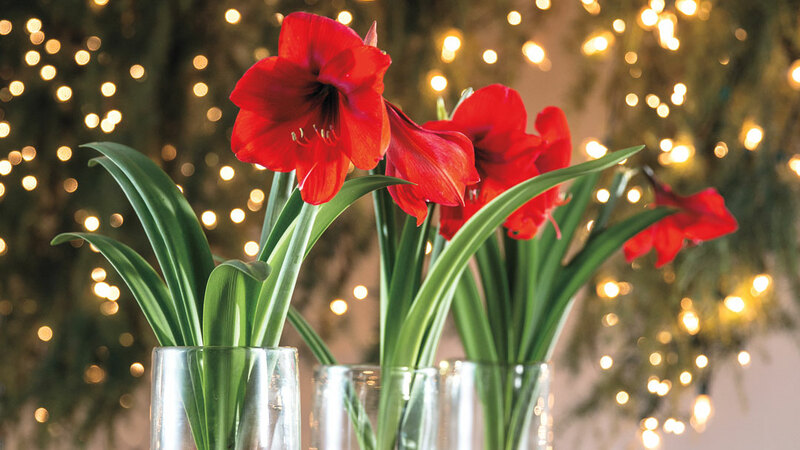 Amaryllis’s popularity has flourished in the last few years, and they are now one of the top Christmas gift plants. Who wouldn’t want to receive one of these colorful blooms in the midst of the lifeless winter months? Where Should I Place My Amaryllis? How Do I Water My Amaryllis? The single Amaryllis will need about 8 ounces (1 cup) of water to stimulate growth, and the containers that have 3 bulbs will need 10 to 12 ounces of water. Containers with four to five bulbs will need 12 to 16 ounces (2 cups). Without sufficient water and proper air temperatures (65-70 degrees F), bulbs will be really slow to take off. So be sure to water well (but not to overwater, as this can cause bulb rot), and remember to provide warm temperatures. After the initial watering, make sure to check the bulbs once a week, and add small amounts of water as needed. To check to see if water is needed, simply touch the surface of the soil, or poke your finger slightly into the surface to see if it feels moist or not. If dry, then go ahead and add ½ of the recommended amounts mentioned above for each size container. Continue to check weekly or as needed. Once growth initiates, feed bulb with a water-soluble 20-20-20 fertilizer every two weeks. Waxed Amaryllis bulbs do not require water, and have everything they need to grow inside the wax. How Do I Get My Amaryllis to Re-bloom? Cut back the flower stalk(s) 1 to 2 inches above the neck of the bulb after blooming stops, (but allow the foliage to grow). Continue caring for your Amaryllis as a house plant by keeping it fed and watered so the soil is moist but not wet. Jackson & Perkins bulbs are delivered in minimal soil, so to keep your bulb healthy for re-blooming, you will want to add extra fertilizer and soil, and transplant the bulb into a roomier container with drainage holes. Feed until September, and continue weekly watering. In October, cease watering completely. Leaves will follow shortly and then blooms. 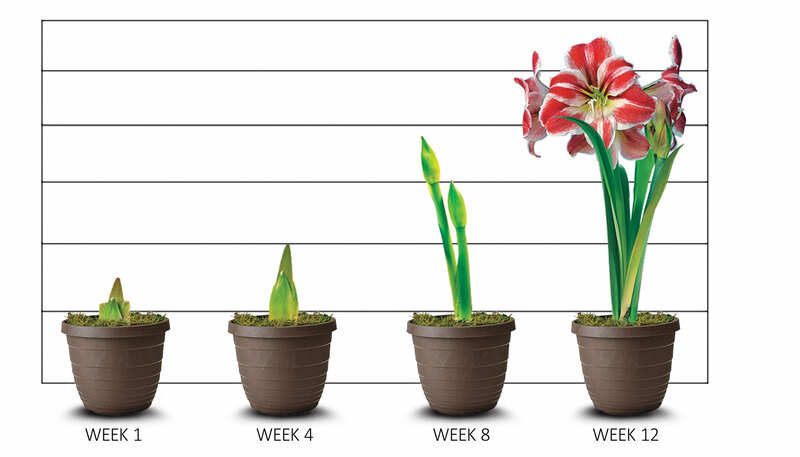 Now it’s time to bring your Amaryllis back to the growth and bloom stage. Your Amaryllis will be able to live happily and bloom for many years in the new, larger container. Bring back into bright light, resume watering, and remove any dead foliage. 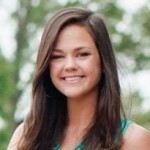 You may want to re-pot in some fresh potting soil to rejuvenate the bulb as it grows. Note that waxed Amaryllis bulbs will not re-bloom, and cannot be replanted after the holidays. What About These Long Leaves? A bulb that produces leaves first makes you wonder if there is something wrong with the Amaryllis because it is only growing leaves and showing no bud yet. That happens with some, and it isn’t something out of the ordinary.